The wall I chose to put the board and batten on is part of a random hallway that has a closet on one side (which we use as a pantry) and a blank wall on the other side. The door at the end of this hallway leads outside to our back patio. We didn't previously use this door because there are 2 other doors that also lead to this same patio, so we stuck a time-out chair at the end of the hall and never went in and out of that door. Up until now, this was known as the "time-out hallway". 1x6 pine boards for top horizontal board **I used pine, but not the cheapest knotty pine. I wanted a smooth finish, so I paid a small amount more for the smooth pine boards. Your wall and measurements will obviously differ from mine, but just to give you an idea, my wall is 118" long. 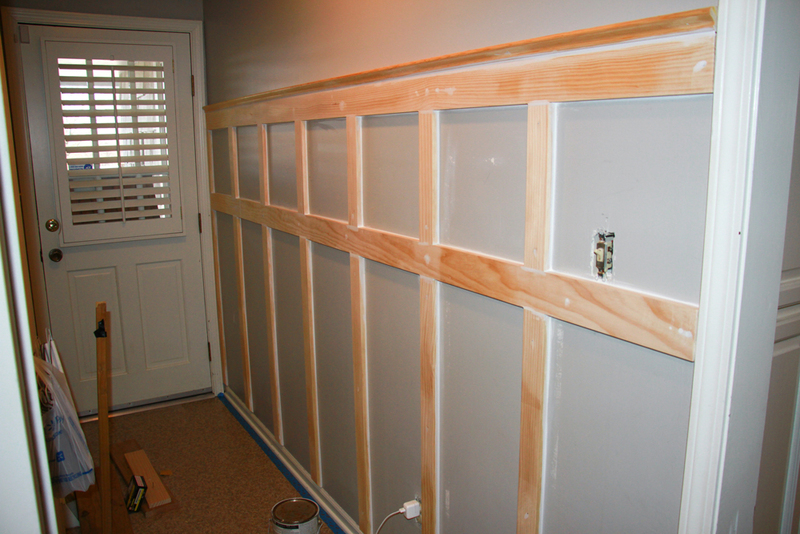 I spaced the vertical boards 14.5" apart from each other, and the top and bottom horizontal boards were 13" apart. 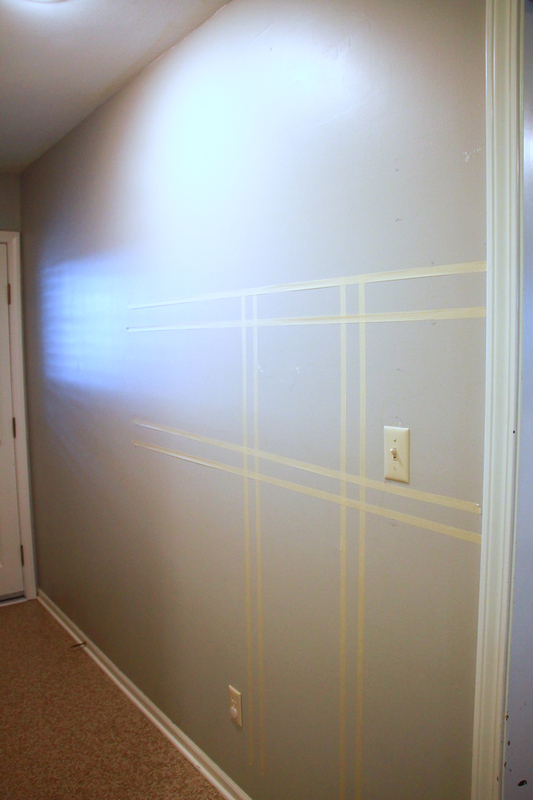 The first thing I did was measure out where I thought I wanted the boards to be, then I put tape on the wall to help me visualize it. I am glad I did this because my original plans were to make the horizontal boards higher then they ended up being. I was working around the light switch simply because I didn't want to have to cut a board to go around it, so I had to decide if I wanted the lower board above or below the switch. 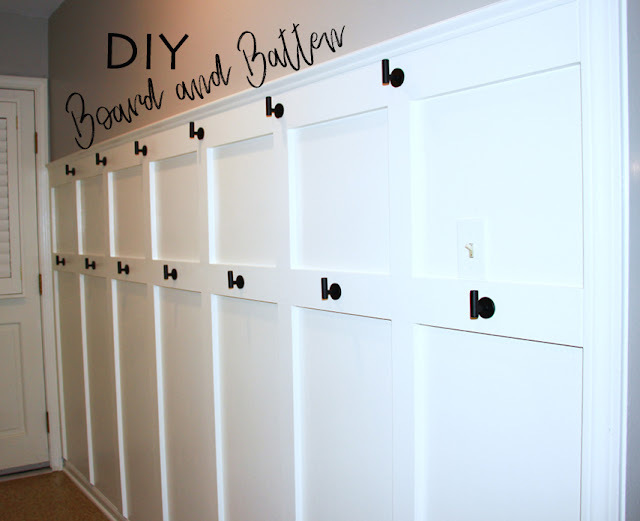 I decided to put it below because the purpose of this wall was to organize coats and backpacks, and I was worried if I put it above the switch, the boys would not be able to reach the hooks...which defeats the whole purpose. 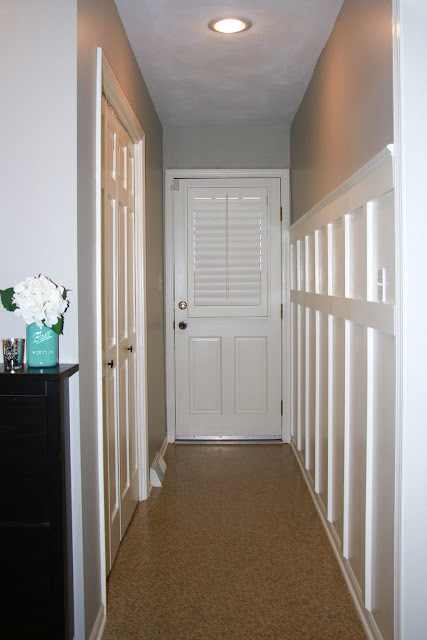 I have seen board and batten at all different heights, so this is a personal preference and depends on your ceiling height and the purpose of your wall. Luckily, I think it all looks great, no matter what height it is, so there is a lot of flexibility! After measuring and determining the distance between boards, I headed to Home Depot to gather my materials. Here's a little tip: If you don't have a table saw, or other means to cut the boards, they will cut them for you. 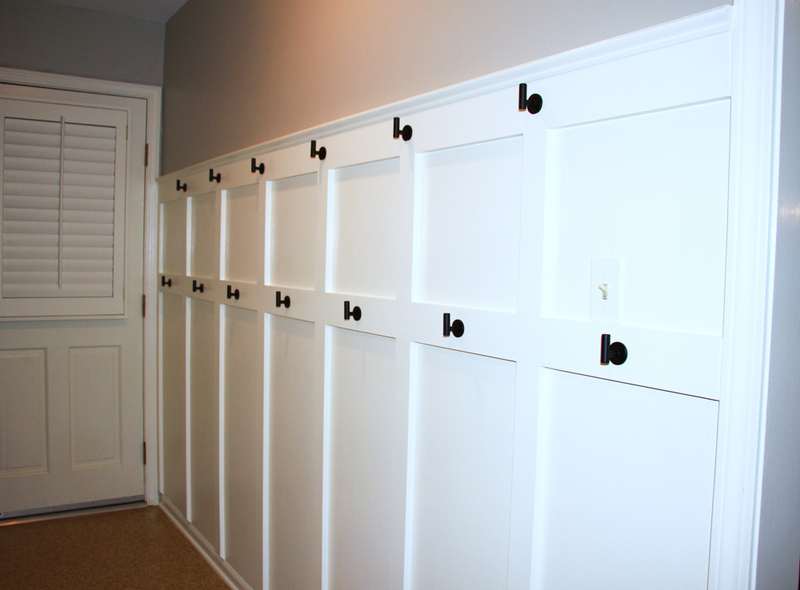 Just be sure to have ALL of your measurements when you purchase the boards! My husband was able to help me cut the boards, so we did all of that at home. 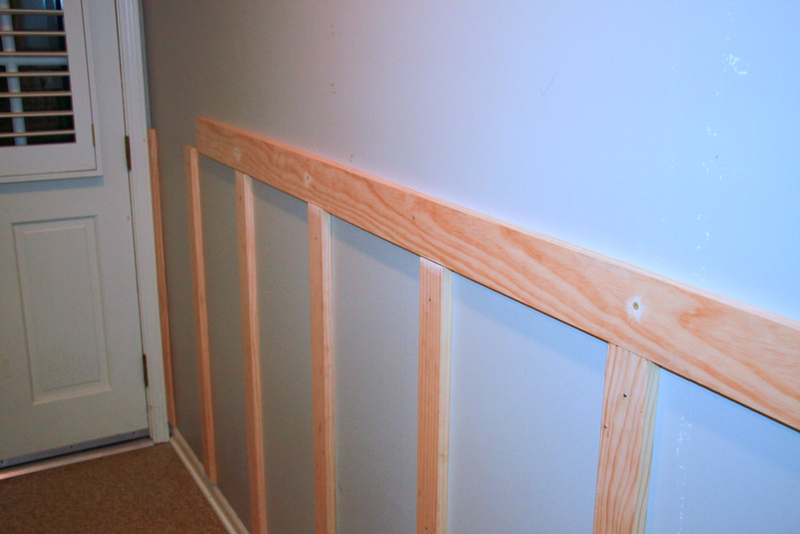 Because I was hanging hooks on my board and batten, I needed some of the boards to be secured in the studs. 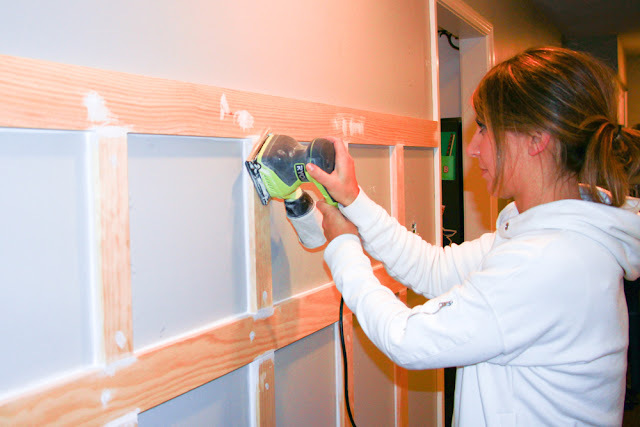 The horizontal boards were screwed into the studs, while the vertical boards were all just nailed to the wall with finishing nails. Just like any other DIY project I have attempted, I ran into a little bit of a glitch. I knew I wanted some sort of trim at the top to make it look more finished. I originally put a 1"x4" board along the top of the board and batten, but when I put the trim piece over the 1x4, it looked funny. It was too small and not the look I was going for. I added a 1x2 to the top of the 1x4 to make it a 1x6 (have I totally confused you yet?) and then put the trim piece over the 1x2. Those extra 2 inches made all the difference and really made the top more of a statement, especially with the trim piece attached. I just caulked the seam between the original 1x4 and the added 1x2, and you can't even tell they are 2 separate pieces now. Live and learn! That's what it's all about! Let's talk about the bottom of the board and batten. I had looked up numerous inspiration pictures online before tackling this project. 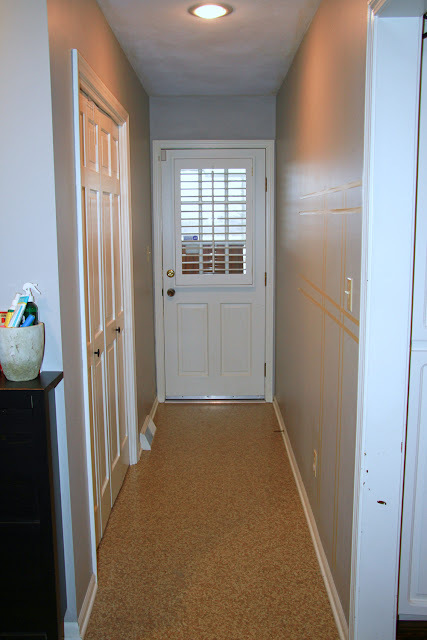 One of my concerns was how to make the new boards blend into the existing trim on the floor. This same trim is all throughout our house, so I knew changing it was not an option at this point. Lots of other board and batten walls have a bottom horizontal board to frame out the entire project. However, with our puny little trim, the new board would have looked awkward next to it. Instead, I decided to cut the bottom of the boards at a 45° angle. 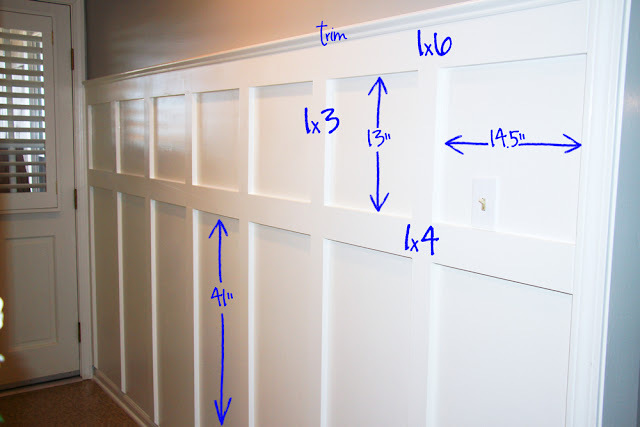 This way, they merge nicely into the existing trim and don't appear to stick out too far. After I got all of the boards screwed/nailed to the wall, I caulked all of the seams. I did this because I didn't want any cracks where the paint might seep in between the wood and the wall. Just run a thin line of paintable caulk down the seam, then use your index finger to smooth it out. Wipe any excess away with a damp cloth. They sell tools for this, but I find that my finger works so much better! 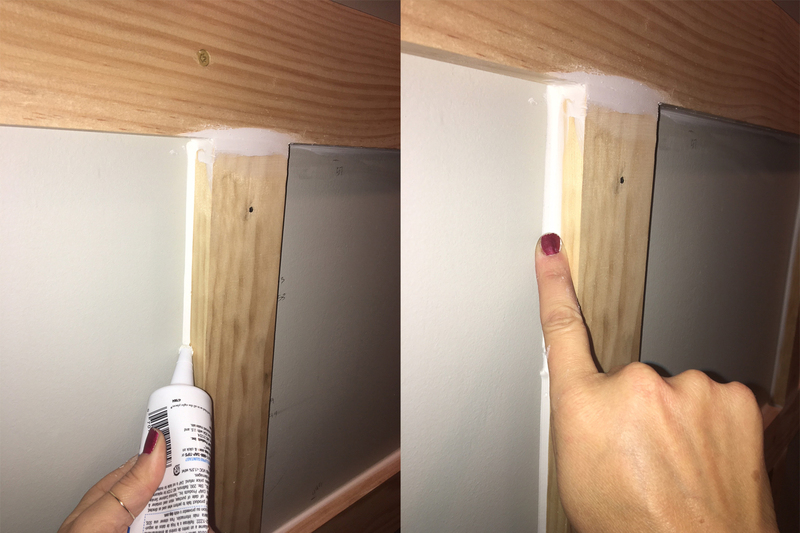 While the caulk is drying, fill in the nail/screw holes with spackling paste, then let everything dry. I let it dry overnight, but you can read the package for the minimum dry times if you're in a hurry. This next step is my least favorite part of the whole process. SANDING. Can't say I'm a fan of sanding. I used an electric sander for the flat boards, but I had to do a lot of sanding by hand when it came to the crevices and the trim. My arm wanted to fall off and the muscles in my palm were so sore! But it wouldn't be DIY without a little blood, sweat, and tears! Thankfully, there was no blood involved in this project. Or tears for that matter...but you know what I mean! 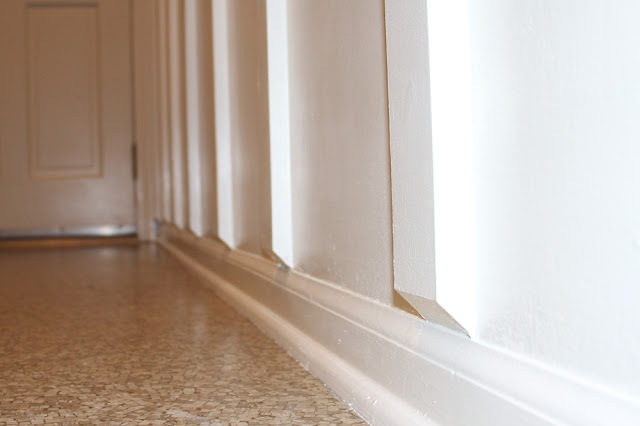 Now that the wood and all of the caulk/spackling is as smooth as a babies bum, you are ready to clean it up. I vacuumed the space and tried to get rid of as much dust as possible, then I wiped down the entire area with a damp cloth, rinsing it often. Once it dried, I used a tack cloth to pick up any remaining dust particles. Just lightly run the tack cloth over every surface you plan to paint. My walls were already painted, so I just primed the boards with 1 coat of primer. Once that was dry, I painted the entire area, boards and wall, with 2 coats of semi-gloss paint. 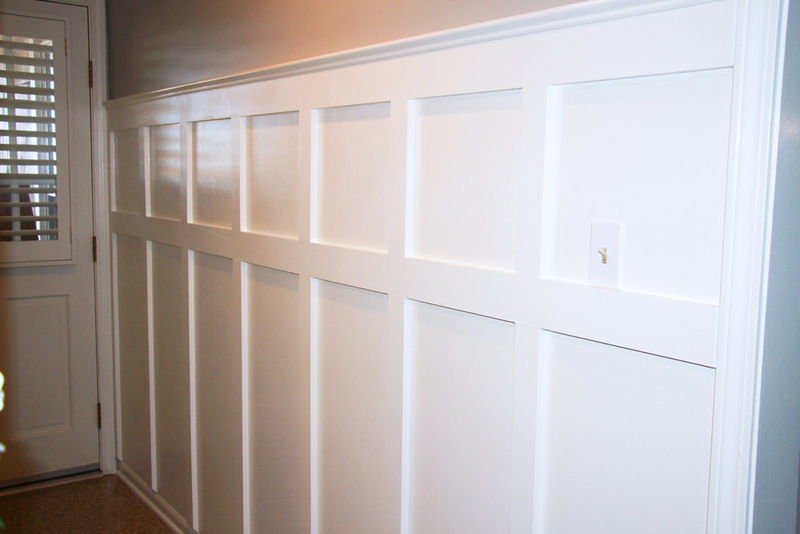 I used Sherwin Williams Dover White because that's the color the rest of our trim is painted. Honestly, I was so happy with the way it turned out, I didn't even want to drill holes in it and hang the hooks! 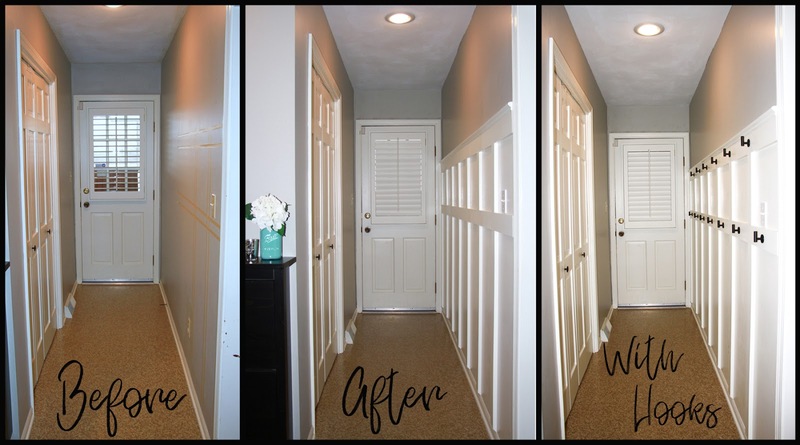 I just love how it brightened the space and really transformed this otherwise boring little hallway! Buuuuuuut, the whole point of this project was to help organize the coat clutter. So, despite my hesitations, I proceeded with adding hooks. All in all, this project was super fun, extremely inexpensive and a huge bang for my buck! I spent $72 on materials, not including paint or hooks. I happened to have some paint leftover, but even if I had to purchase paint, the total would have been under $100! 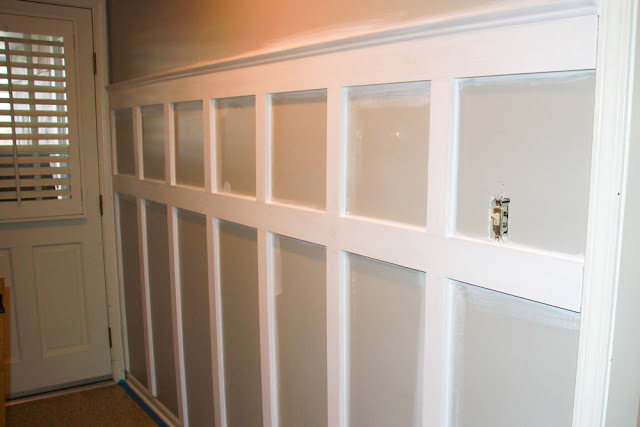 There aren't too many home improvement projects out there with that low of a price tag. And the best part is, you don't need to be super handy to tackle this one! THESE are the hooks I added, which also added an extra $50 to the total cost of my wall.